According to a new survey, over 84% of mothers online — some 27-million women — can be grouped into 5 “digital mom” categories. However, these tech-savvy mothers use the internet, social media, gaming, texting, and other online content in different ways and for different purposes. Churches can benefit from the insights of this new study by the marketing company Razorfish, and the world’s largest mom-centric website, Cafe Mom. Typically in her early thirties with one preschooler, and possibly more on the way, this mom is as likely to be stay-at-home as employed. She balances the most limited household budget of all 5 types, and so needs to shop for value. This mom is a highly socialable networker, and has a higher than average number of friends in her online social network. She both creates and participates in online polls as one of her favorite ways to engage with others. Her social network page is often decorated with digital badges, photos, and playlists which communicate her style. Marketers can involve the self-expressor in their online brand campaigns by appealing to her artistic and individual sense. She seeks the advice of real-world friends on parenting, but then turns to her online friends for addition advice and guidance. 40% of moms fall into this category. The utility mom is in her mid-to-late thirties and is raising a couple of tweens. She is likely to have the most children at home, yet spends the most time online in her social networking groups. Yet, she prefers to bring her own real-world friends into her online network, rather than make new online friends. She is more likely to join online groups, particularly if they are local school groups or groups providing practical information. While she will answer other online polls, she creates little online content herself, and has the fewest online photos posted of any group. She does like online game and quiz widgets, but values information from her real friends over that of her online network. The utility mom uses her social network time for both monitoring her own children, and her own enjoyment of playing games or answering quizzes. This mom is 26% of digital moms. This mom is in her early thirties with elementary school-age children. As the name implies, she is more likely to join groups or start groups than any other digital mom segment. But she is also not the most social of the digital moms, receiving more friend invitations than she sends. She is confident and sees herself as a go-to person for advice, but not necessarily shopping advice. She depends upon her online friends for parenting advice, although she says she is more influenced by brand programs on social networks when it comes to purchasing. She also ranks the highest in sending private messages online, and values 1-to-1 communication. The groupster mom is 12% of the digital mom cohort. In her twenties with her first baby, this mom is looking for information. She is among the best educated of all the moms, and is most likely to be a stay home mom. She is interested in parenting information, which she prefers to get from real friends, but she will also turn to online parents in similar situations to hers. She values the mom-to-mom conversations online, but while she uses social networks, her primary concern is to get product or parenting guidance. The info-seeker is 12% of the total group. This mom is the oldest, usually in her forties, with the oldest kids, usually teenagers. Experienced as a parent, she uses social media more to chat with others, and gain information on products she might be considering. She also monitors her own teens online usage, and is likely to play video games online with others. She accesses digital news channels more than younger moms, and also blogs, leaves comments on the blogs of others, and is the highest content creator in the survey. She is highly active, inviting others to join her online community of moms. She values this online community more than expert opinions, online reviews or print advertising when it comes to purchasing decisions. This mom is 9% of the digital mom universe. All of these digital moms value WOM — word-of-mouth — recommendations, especially when the WOM comes from their online network. While all of these moms use digital media, they do so for different purposes and in different ways depending on their age and the ages of their children. From a marketing standpoint, online advertisers should engage these digital moms, rather than just depend on banner ads displaying on social networking sites. The same might be said for churches and women’s ministries. You can download and save the full report here. 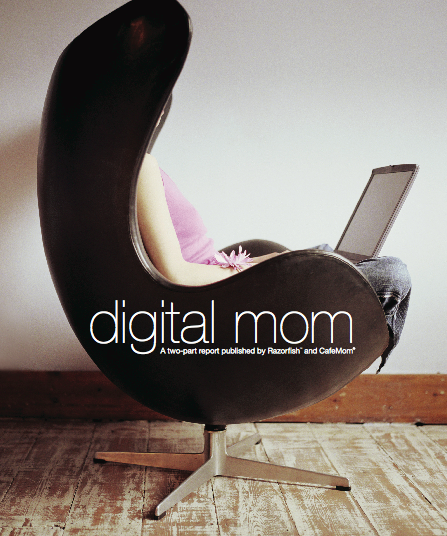 The report is 36 pages and filled with charts and text explaining how each “digital mom” segment uses Web 2.0 media. If you’re interested in women’s ministry, the internet, demographics, or social networking, this report will give you lots to think about.